As 2012 draws to a close, a few developments over the last fortnight are worth mulling over, ahead of uncorking the champagne to usher in the New Year. But first, a word on pricing - the final ICE Brent February futures contract price cut-off noted by the Oilholic came in at US$110.96 per barrel with US budget talks in the background. Over the last two weeks, and as expected, the cash market trade was rather uneventful with a number of large players starting the countdown to the closure of their books for the year. However, the ICE’s weekly Commitment of Traders report published on Christmas Eve made for interesting reading. It suggested that money managers raised their net long positions in Brent crude futures (and options) by 11.2% in the week that ended on December 18; a trend that has continued since November-end. Including hedge funds, money managers held a net long position of 106,138 contracts, versus 95,447 contracts the previous week. Away from Brent positions, after due consideration the UK government finally announced that exploration for shale gas will resume albeit with strict safety controls. Overall, it was the right decision for British consumers and the economy. It was announced that there would be a single administrative authority to regulate and oversee shale gas and hydraulic fracking. A tax break may also apply for shale gas producers; further details are due in the New Year. Close on the heels of UK Chancellor George Osborne’s autumn statement and the shale announcement, came a move by Statoil to take a 21-year old oil discovery in the British sector of the North Sea off its shelf. On December 21, the Norwegian company approved a US$7 billion plan to develop its Mariner project, the biggest British offshore development in over a decade. According to Statoil, it could produce around 250 million barrels of oil or more over a 30-year period and could be brought onstream as early as 2017 with a peak output of 55,000 barrels per day. Mariner, which is situated 150 km southeast of the Shetland Islands, was discovered in 1981. The Oilholic thinks Statoil’s move is very much down to the economics of a Brent oil price in excess of US$100 per barrel. Simply put, now would be a good time to develop this field in inhospitable climes and make it economically viable. Being the 65.11% majority stakeholder in Mariner, Statoil would be joined by minority stakeholders JX Nippon E&P (28.89%) and Cairn Energy (via a subsidiary with a 6% stake). Elsewhere, Moody's changed the outlook for Petrobras’ A3 global foreign currency and local currency debt to negative from stable. It said the negative outlook reflects the company's rising debt levels and uncertainty over the timing and delivery of production and cash flow growth in the face of a massive capital budget, rising costs and downstream profit pressures. “We also see increasing linkage between Petrobras and the sovereign, with the government playing a larger role in the offshore development, the company's strategic direction, and policies such as local content requirements that will affect its future development plans,” said Thomas S. Coleman, senior vice president, Corporate Finance Group at Moody’s. That’s all for 2012 folks! A round-up of crude year 2012 to follow early in the New Year; in the interim here’s wishing you all a very Happy New Year. Keep reading, keep it ‘crude’! © Gaurav Sharma 2012. 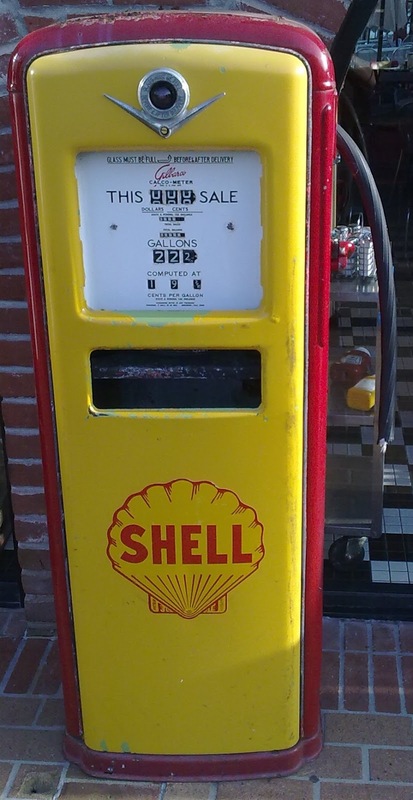 Photo: Vintage Shell pump, San Francisco, USA © Gaurav Sharma.